Being Christmas and all, there's one movie that I always watch around this time of the year: Dr. Seuss' How The Grinch Stole Christmas. It's a true holiday classic and one of my favorites. When I saw the game in the AppStore, it was without hesitation that I purchased it. Grinchmas is a fun game for all ages where you take control of the Grinch himself and throw snowballs, or presents as the case may be, at the Who houses down below. Depending on how you're feeling, you can choose to play the nice mode as the Merry Grinch or the, well, not-so-nice mode being Mean Grinch. In the nice mode, you'll be sending presents to all the Whos that are waiting for Christmas in their own houses. In the naughty mode, take a grip of yourself and don't let that heart of yours get any bigger! Those Whos are making way too much noise, so grab snowballs and throw it at them to make them keep quite once and for all. Remember, you hate Christmas! The iPhone game features a simple aim-and-throw type of mechanics. All it matters is the direction and speed of your swipe across the iPhone's screen. There are seven houses to hit scattered across the snowy landscape, and the Mean Grinch has it easy for him. Fast swiping of snowballs, kind of like an automated machine gun, is the way to go and you'll have those Whos silenced in no time. Merry Grinch needs to match the right color of present with the appropriate house, which makes machine gunning of presents useless. This does add a bit of difficulty to the game, but even if you've bought Grinchmas for your youngsters, the levels are still doable. The graphics are well done, nicely 3D rendered, and this, coupled with the sound theme (a nice Christmasy jingle) and the Whos sound effects, make up Grinchmas. The game is a bast of fun for all ages, staying true to the genre: casual gaming. It's a clear pick-up-and-play, without any intricacies of a developed storyline. Sadly, the only part of the Grinch you will see is his fury arm. I'd have liked to see him dancing around, scaring Whos and what not. All in all, it didn't fit with the purpose of the game, so I'll tone the critiques down a bit. Grinchmas did not leave me with a heart a size or two smaller. Au contraire! I absolutely got into the holiday spirit, loved to see the Grinch on my iPhone and now I'm warmly recommending it to all you Whos out there. It sells for $1.99 in the AppStore, a price that may be a bit steep if you're thinking it's just one game mode with two graphics. 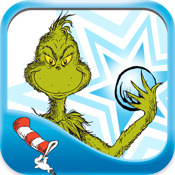 Nonetheless, the game is worth it even if only to have that nice Grinch icon on your iPhone. What do you think of Grinchmas ? Scroll down for our comment section and let us know!.